Group stand hunting — two or more hunters using a well-orchestrated hunting plan — can be amazingly successful way to hunt big bucks. A two- to three-man method we refer to as “the gentle nudge” has accounted for one to two adult bucks in our camp during almost every deer hunting season since 1990. Using this method, my son, Ken, took a big buck on five consecutive opening days (three are on the wall). I was the upwind hunter (the nudger) during four of those hunts. I was also the upwind hunter when my daughter, Kate, took her big 10-pointer. Two big bucks that I took while using this method are staring at me from a wall of my offices as I write this. This is an unusual hunting method worth knowing about. 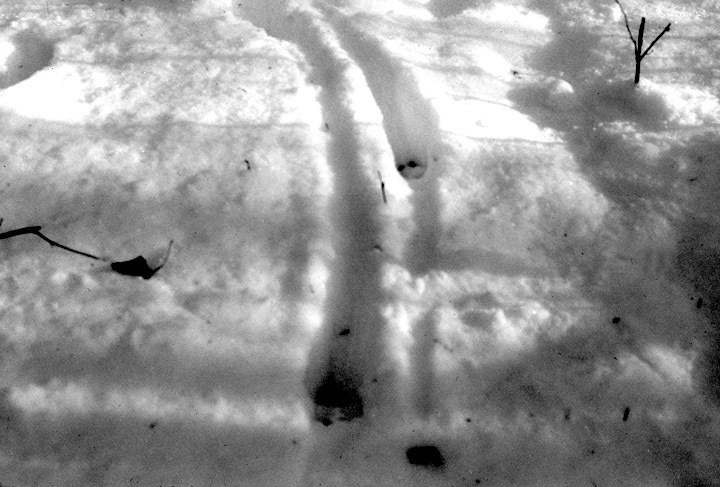 In our camp a “nudge” typically begins with the discovery of tracks in the snow made by a buck under the spell of doe-in-heat (estrus) pheromone — the buck drags its hooves from track to track. My kids call such tracks “railroad tracks.” Such tracks mean the buck is currently accompanying a doe in estrus. If it's midday, the buck is with the doe in its bedding area. Early and late during the next 12–24 hours, it will be trailing that doe in the nearest feeding (browse) area. Knowing where most doe bedding and feeding areas are located enables us to accurately pinpoint the current location of the buck — the vital bit of knowledge needed to set up a gentle nudge. Given such knowledge, most hunters would immediately suggest making a drive: placing some stand hunters downwind and using hunters afoot upwind in an attempt to drive the buck toward the stand hunters. This rarely works because experienced adult bucks recognize the danger of being driven far in any direction by humans or wolves. Expecting an ambush in such a situation, a fleeing buck will quickly veer right or left and then head into the wind, thus able to smell what is ahead and easily avoid any other hunter that might be in its path. The gentle nudge works because the buck is not driven in the usual manner. In most cases the buck won't even become alarmed. When finally seen, it will be walking at a leisurely pace. Here's how its done. Upon discovering the probable location of an adult buck, before heading out, we get out our hunting area map, a compass and check the wind direction to decide where the two to three hunters taking part should sit and how best to get there. The one to two hunters who will sit downwind leave camp 15–30 minutes before the single upwind hunter departs. The downwind hunter(s) must take their time, moving as silently as possible. This hunting tactic won't work if the buck knows a human is located downwind. The downwind hunter(s) generally ends up sitting on a natural elevation (or in a tree stand) overlooking a well-used deer trail about 150–200 yards downwind of where the buck is thought to be located. The upwind hunter takes a route that insures his airborne odors will first be smelled by the buck while the hunter is 200 yards or more away. Whitetails can determine how far away a human is located via airborne scents alone and adult whitetails do not generally react with alarm upon smelling a human 200 yards or more away. At this point the upwind hunter loops toward the expected location of the buck, finally halting and taking a seat 100–150 yards directly upwind. Once the buck (and other deer) gets a whiff of the upwind hunter 200 yards or more away, rather than flee, it will continue doing what it was doing (resting or feeding) but carefully monitor the movements of the hunter via smell and hearing. Soon after the hunter stops and sits, the downwind deer will realize the hunter is no longer moving, telltale odors no longer increasing in intensity and the source no longer changing in location. Meanwhile, the hunter's scents are spreading downwind throughout a pie-shaped area. One hundred yards downwind, his odors can be detected by deer along a front nearly 200 yards wide, forming an invisible fence. Though the downwind deer are not alarmed, upon departing from the area, they won't travel upwind. Not being pushed by an approaching hunter, the will willingly travel downwind, walking. Within 15 minutes to four hours, the upwind hunter will hear the downwind hunter's shot. While setting up this group hunt, I can't be sure where the buck will be at any one time nor can I be sure which area or which trail it will use while we are out there. The best I can do is position stand hunters at locations and trails I know the buck has frequented during the previous few days. This hunt requires an early start in the morning because the last of the hunters being led by me and sometimes another hunter to stand sites must be there before first light. 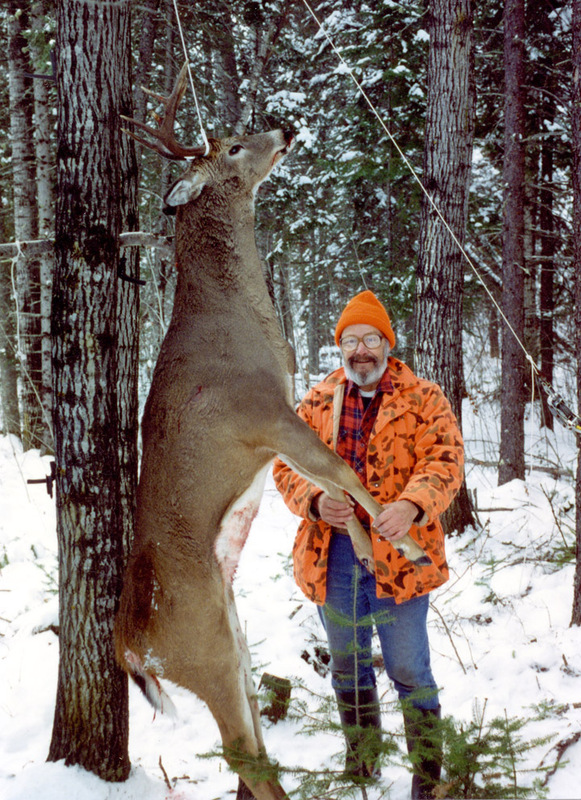 [Editorial note from Doc's son John: Let me explain this further, because it might seem very odd to some hunters. Sometimes, we must lead very experienced hunters of our own group to stand sites because they normally don't hunt the specific areas where the stand sites are located. As ethical and courteous hunters, we don't hunt other hunters areas — that includes within our own group. I haven't even seen 99% of my two brother's adjacent hunting areas in last 10 years — and then, usually, only to drag a buck.] Unfortunately (for me), someone else in the group generally takes the buck. Whenever I suggest such a hunt, all in camp are eager to take part because we rarely fail to take the buck within four hours after arriving at our stand sites.